Wow, we did it! This year for the first time we entered The Great Taste Awards, nervously submitting our Apple Syrup to a blind tasting by some of the most highly regarded foodies in the country. There were over 12,600 entries this year, and there’s no set allocation of awards – if you’re good enough you get a gold star, if you’re not, you don’t. It’s that simple. We’re delighted to announce that the Apple Syrup has been awarded a Gold Star! That means it was judged as ‘extraordinarily tasty’. The Judges said, ‘Deep apple flavour settles into a dried fruit datey, raisiny sweetness. Good balance of sweet sour tang, would work in a dressing as well as the sweet suggestions’ and ‘Lovely colour and consistency. The massive hit of sweetness comes from the reduction of the apples’ and ‘A sticky and dark syrup with a toffee apple flavour’. Liberty Fields, the West Dorset artisan food and drinks producer, have been working on streamlining their production methods in order to meet demand for Porter’s Perfection Vodka – and it’s had a very clear result. Porter’s Perfection Vodka is available from good independent wine shops, delis and farmshops across the South of England, and from Nectar Imports, Diverse Fine Food and The Cress Co. See http://www.libertyfields.co.uk for stockists and for more information. If you want to try Porter’s Perfection Vodka and see what you think, Liberty Fields will be exhibiting at The Dorset Festival of Food & Arts at Poundbury on 4 August, The Melplash Show in Bridport on 23 August, and the Sturminster Cheese Festival on 8 and 9 September. We are very pleased to announce that the full range of Liberty Fields products is now available from The Cress Co, one of the largest distributors covering the vast majority of the UK. Their Christmas catalogue is now available online, with minimum orders of only £125 to avoid carriage. Like many people, we’ve been looking at the amount of plastic we use in our business and trying to work out the best way to reduce it. We’re looking at a number of different ways of tasting our products at shows and in shops, as well as thinking about ways in which we can encourage customers not to want plastic bags when they purchase. Our first change is that we have sourced new tops for our bottles. Currently most of them are cork, with a plastic top, but we are now swapping (whenever possible) to cork with a wooden top. It’s a small step but hopefully only the first of many. We’re really proud of Liberty Fields Apple Aperitif. At shows and tastings, it’s nearly always our most popular product – people love the unique taste, the fact that it’s made purely from Dorset apples, as well as its versatility, especially when they learn that you can drink it neat or mix to make a longer drink. However, over the last couple of years, we’ve received a lot of feedback from shops and customers saying that they find the name confusing. Sometimes people don’t know an apertif is, when to drink it or what to do with it. This – we hope – clarifies that it’s something which is a brilliant accompaniment to puddings, cake or mince pies, or a plate of cheese (as well as a drink that you can combine with spirits, prosecco or mixers to make a longer drink). And it’s only 7% alcohol too. It’s the same product that customers love when they try it, it’s made in the exact same way, the packaging is exactly the same – it’s just the name that’s changed! We’re currently making the 2016 Vintage (that’s using apples picked in Autumn 2016, gradually heated to concentrate the flavour and sweetness, then slowly aged in barrels for an extra depth of flavour) so this seemed the perfect time to launch our new name. We held our first community Wassail on Sunday 22 January 2017, and we were so pleased by the response and the turnout. With a competition for the best decorated hat, song and music provided by the Ridgeway Singers, a fabulous warm punch created by Lloyd Brown, bonfire and a rocket, we did our best to drive the evils spirits out of the orchard and to help this year’s harvest. Some great coverage of our first Wassail (January 2017) in our local media, including the Blackmore Vale and Dorset Echo. Liberty Fields, who make unique apple-based products on a farm in West Dorset, has been judged to be ‘one of the most deserving small independent food businesses in the country’ by the BBC Good Food Show. 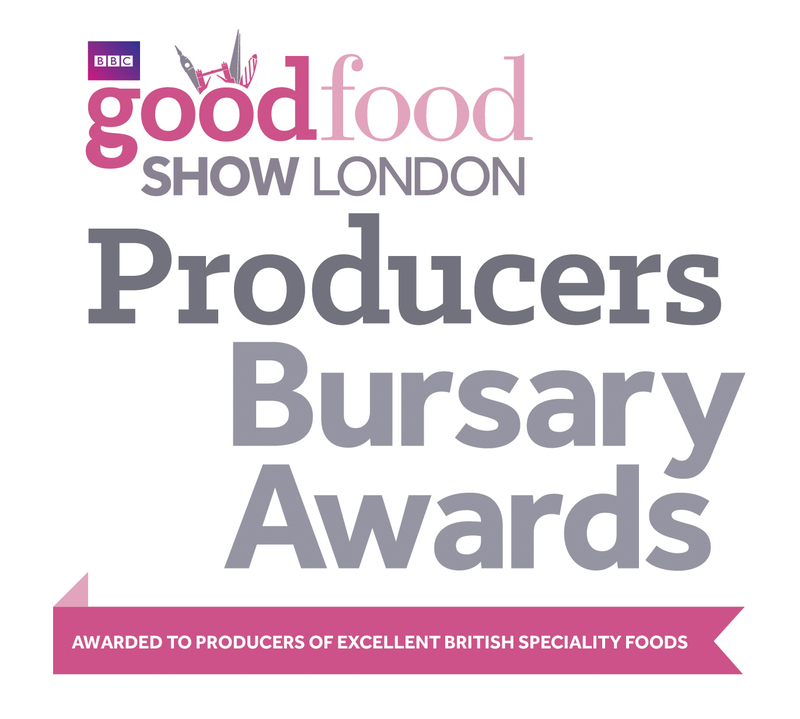 They have been awarded one of the highly coveted Producers Bursary Awards and will now be exhibiting free of charge at the BBC Good Food Show at Olympia in London from 13-15 November. All entries to the Bursary Scheme are tasted at the BBC Good Food Test Kitchens by a team of experts, including Barney Desmazery, Food Editor BBC Good Food, Holly Brooke-Smith, Staff Writer BBC Good Food Magazine, Miriam Nice, Food Writer and Katy Truss, artisan food specialist for the BBC Good Food Shows. This year there were hundreds of entries to the Scheme, all of a very high standard, showcasing the great range of food and drink producers in the UK.